Cool user interfaces have The Flow. They let you do what you need to do without consideration or thought. Poor user interfaces break The Flow. What do I mean? Let me explain by example. 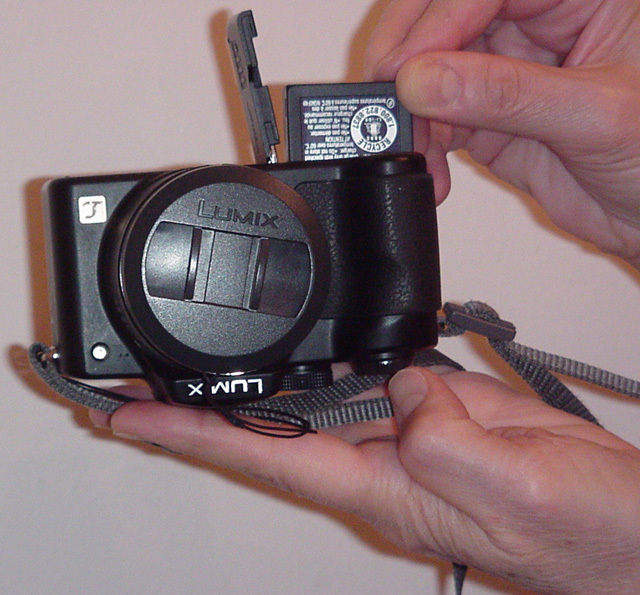 The battery fits into this camera in exactly one way. Turn it upside down or around, and it doesn’t fit. I invariably try to shove the battery in backwards. Even when I stop and think about the problem and realize that my natural instinct of which way the battery goes is wrong, and deliberately reverse it, I still put it in the wrong way! I have no idea how Panasonic managed this, but they did. This device does not have The Flow. What should Panasonic have done? Either reversed the battery compartment or the battery itself. That way it would go in right every time. Better yet, they could have designed the battery so it would fit in and work both ways. I do not know how Panasonic might have deduced from first principles that their battery compartment was backwards, but certainly user testing should have found and corrected this. If user testing revealed that users are split–some expect the battery to go in one way and some the other–then they should have just made it work both ways; but in any case they should have made it work. This is not as bad as it could be. I have encountered devices where the battery fit in both ways, but only worked if you put it in the right way. I have even encountered devices where putting the battery in the wrong way could damage the device, cause fires, and injure people. So this is not a truly awful user interface, but it still doesn’t have The Flow. I have had this watch for years. I have spent more than the watch is worth just replacing the wrist band. Why do I still hang onto this old, grody watch? Because it has The Flow. Unlike every other digital watch I have ever owned, it actually works the way I expect. It’s not that I’ve learned to use it and gotten used to it. It worked the very first time I tried to set the time. It has worked every time since that I have tried to do something: set the alarm, change the time, run a stopwatch. etc. I don’t think about it. I don’t read the manual. It just works. For example, I change time zones a few times a year. When I do so, I set the watch. I do not change time zones often enough that I remember how to change the time on my watch, nor do I carry the watch manual with me. I simply guess which button to press when. What’s different about this watch is that my guesses are invariably correct. 30 seconds later I have a correctly set time. With every other watch I have ever owned, I have had to struggle for minutes and sometimes consult the manual just to do something as basic as adjusting the time a few hours one way or the other. I used to regularly spend a week on the other side of the country converting the time in my head from my local timezone because it was too much of a pain to change my watch. No longer. I do not know how Timex did this. Possibly they tested their watch to see which buttons people expected to press when. Perhaps they made the watch bigger so they had room for more obvious labels on every button. Whatever they did, it worked. This watch has The Flow when so many other watches don’t. I do not know how to design The Flow into a product (the recommended books below may have a few suggestions on that) but I know it when I see it. More importantly I know when a product doesn’t have The Flow. Product designers, however, are notoriously bad at figuring out whether their product has The Flow or not. many of them don’t even recognize that their product has a user interface, much less that the user interface is far more important to a successful product than any of the cool new features they’ve added. I suspect the only real way to tell if a product succeeds in getting The Flow or not is to test it on real users and see how they react with it. The results can be illuminating. This entry was posted on Wednesday, March 29th, 2006 at 5:40 pm and is filed under User Interface. You can follow any responses to this entry through the Atom feed. You can make a comment, Digg this story, or trackback from your own site. What do you have to say about The Flow for library APIs? Just curious since I’ve been doing this a bit myself recently and I definitely find TDD helps me get a more compact, usable API. I know other people that refuse to do this and insist on defining the API up front. What worked for you with XOM? TDD rocks IMHO. However, It’s a hard practice to get into. I’d be interested in Elliotte’s opinion on TDD also. What do you have to say about The Flow for library APIs? Just curious since Iâ€™ve been doing this a bit myself recently and I definitely find TDD helps me get a more compact, usable API. I know other people that refuse to do this and insist on defining the API up front. What worked for you with XOM?